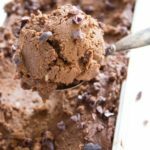 Enjoy this rich and creamy chocolate avocado ice cream as a sugar free, low carb and keto treat. And feel that satisfaction of hiding a vegetable in a dessert! Place all ingredients in a food processor or mix with a hand blender until smooth. Check and adjust sweetener if necessary. Stir in the cocoa nibs, if using. Place in a container lined with baking paper. Cover and freeze for 4-6 hours. If frozen overnight, you'll have to let the ice-cream defrost for 20 minutes before attempting to scoop.